Flower gardening is one of the most satisfying types of gardening – its only purpose is to bring beauty into the world, and who of us doesn’t need that? Before you go off willy-nilly to the nursery, you need to spend some time familiarizing yourself with the whats, hows and whys of flower gardening to get the best result. There are three kinds of flowers to work with: perennials, annuals and biennials. Perennials come back every year with no replanting; annuals have to be planted each year; and biennials last at least two growing seasons. A good combination of all three types gives you a nice variety of flowers. Most annuals bloom all summer long with proper care and add brilliant color to your display. Perennials bloom for short periods of time, and with planning, you can ensure that as one variety is shutting down for the year, another type will start to bloom. When getting ready to plant your garden, take the starter plants and place them in your prepared flower bed to get an idea of what the final result will be. This way you won’t be surprised and disappointed by how it looks after the plants are already in the ground. Now you’re ready to plant. l Dig a hole just slightly bigger than the plant's rootball. l Tap each side of the flower's container with a trowel to loosen the rootball. l Place one hand over the top of the rootball and turn the container upside down, so the rootball is resting on your hand. l Pull the container off with the other hand. l Set the rootball in the hole right side up. l Cover the rootball with loose soil and press down firmly. l Water the rootball thoroughly. l Prepare your soil by scraping off the top layer of soil with a shovel and rake it to gently loosen. l Sprinkle the seeds liberally around the planting area. l Sprinkle potting soil over the top. l Plant bulbs in areas with good drainage. l Don’t use commercial fertilizer or fresh manure when planting bulbs. l When cutting flowers, cut as little foliage as possible because that’s where food is stored for next year's blooming. l Let foliage die on its own before trimming it back or digging up bulbs. Don’t trim back healthy green foliage or the bulb will not perform well next year. 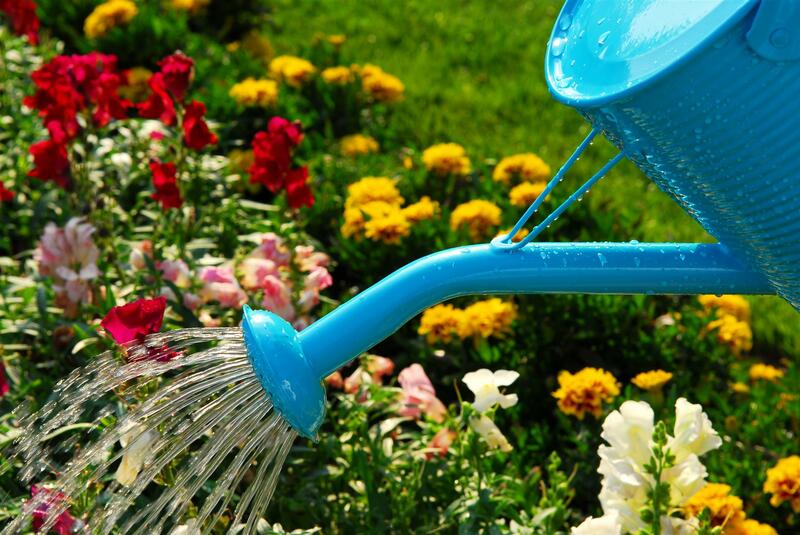 Be vigilant with your weeding and make sure your garden gets at least an inch of water a week. Keep your plants healthy and attractive by pinching off dead blooms next to the mother plant. At Michele Engleman Concierge Real Estate Services we are committed to deliver a real estate experience that earns a lifetime relationship with our clients. Michele Engleman Concierge Real Estate Services promises to provide the highest possible quality representation and service to each of our clients and to exceed their expectations to the fullest possible extent with the outcome of our collaboration in fulfilling their real estate endeavors. We pledge to improve the financial lives of my clients, strategic alliances, and employees to help them exceed their greatest goals.